﻿ Whatever happened to the JPS Norton team? The JPS Norton team put the pride back into British motorcycle racing, winning British championships against the might of the Japanese. The unique rotary-engined Nortons were not only amongst the best-sounding race bikes of all time, they also looked amazing in their silver-gold-and-black livery. It’s no wonder they’re still much missed. But what actually happened to the JPS Norton team and why did it quit racing after the 1992 season? When did the team start racing? Norton guru Brian Crighton built the first Norton rotary race bike in 1987. It was based on Norton’s 588cc wankel-engined Interpol model that was being used by various police forces in the UK. Crighton worked at Norton but built the bike without any help from the factory. When it took third in its club race debut at Darley Moor, the factory decided to get involved. In 1988 the bike started winning national races with Steve Spray at the helm, and that’s when JPS stepped in and agreed to be title sponsor for the 1989 season. There was history between JPS and Norton wasn’t there? Yes. Peter Williams won the 1973 Formula 750 TT on a JPS-sponsored Norton as far back, although the livery was white, red and blue rather than the later black, silver and gold. Yes. In 1989 Steve Spray won the 750cc TTF1 Supercup British championship on his RCW588 ahead of Terry Rymer on a Yamaha OW01 and Carl Fogarty on a Honda RC30. Team-mate, Trevor Nation, also won races and finished in fourth place overall. Didn’t Crighton split with the team? Crighton was promoted to Senior Development Engineer at Norton in 1990 and didn’t have time to devote to the race project so ex-Honda Britain boss, Barry Symmons, was brought in. The team enjoyed more success in 1990, with Nation winning the MCN Superbike series and Robert Dunlop taking third place in the Formula 1 TT on the Isle of Man. Nation went one better to finish second in the Senior later in the week. Dunlop also won both Superbike races at that year’s North West 200. But Crighton and Symmons did not see eye to eye and, after a series of rows, Crighton quit Norton at the end of 1990. Did Ron Haslam actually enter the British Grand Prix on a JPS Norton? He did! Symmons signed returning Grand Prix hero Haslam to partner Trevor Nation on the new NRS588 in 1991 and Haslam took race wins and finished second to Rob McElnea on the Loctite Yamaha in the Supercup British championship. But he sent fans into a frenzy when he scored four points for 12th place in the 500cc British Grand Prix as a wild card entry on the Norton. Haslam suffered a badly broken leg at Snetterton in 1992 and despite good results from stand-in riders like Terry Rymer and Mark Farmer, the Norton was no longer as dominant as it had once been. Robert Dunlop still managed a fine second place in the Supercup championship (the forerunner to BSB) and Steve Hislop famously won the Senior TT on a Norton – but it wasn’t a JPS bike. Why was Hizzy not on a JPS Norton when he won the TT? Because of the inherent dangers of the TT, JPS decided it no longer wanted to be associated with the event so missed out on the rotary Norton’s greatest achievement. Instead, Symmons leased a bike and, with backing from Abus Security and on an all-white bike, guided Hislop to that most famous win. Was 1992 the last season for the JPS Norton team? Yes. 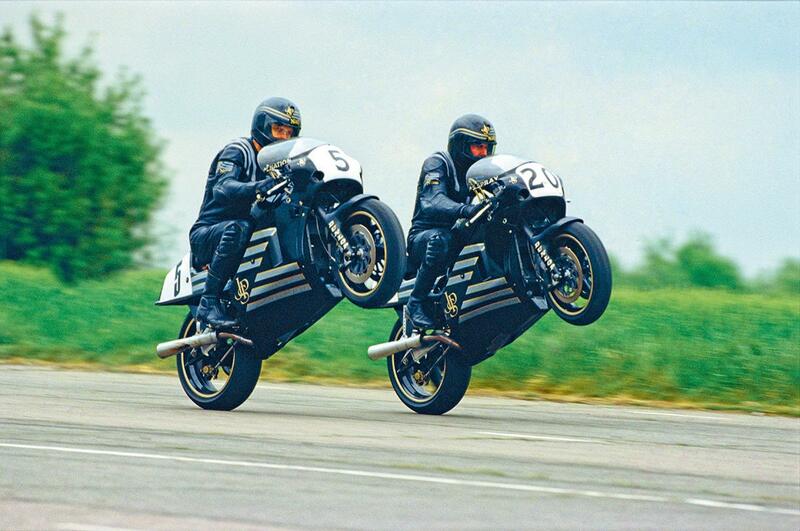 JPS withdrew its sponsorship after 1992 and the official Norton team folded, but that wasn’t the end of the story. Crighton had continued with his own racing project and Ian Simpson won the 1994 Supercup British Championship on the Duckhams-sponsored ‘Roton’ with team-mate Phil Borley coming second. After years of complaints that the rotary Nortons had an unfair advantage over their four-cylinder rivals, Supercup organisers finally changed the rules for 1995 and Crighton’s Rotons found themselves out in the cold. Where are the JPS bikes now? All the JPS Nortons and Duckhams Rotons now take pride of place in the National Motorcycle Museum in Birmingham and many still take part in classic events. If you ever get the chance to hear them run, don’t pass it up. They’ll still make the hairs on the back of your neck stand up.